Froggy's Fiber Followings: Playing with Fire... uh, I meant Fiber! Playing with Fire... uh, I meant Fiber! I finished a little project I set for myself to spin a non-wool yarn. I was pretty excited about it too. 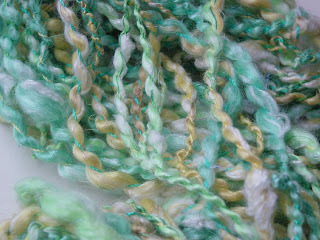 Its dyed tussah silk, carded with glitz, bamboo coils and sari silk handspun then plied with a matching nylon thread. Would you believe those are the same colors I dyed this yarn with? It's interesting how different fibers take dyes so differently. I would love opinions, tell me what you think! This here is something I hope to get posted to the store later tonight. 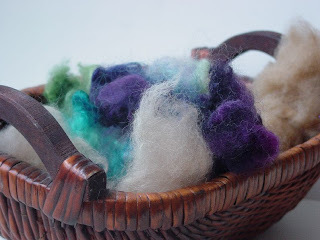 I took bits and pieces of fibers and created a eclectic fiber sampler mix. These are a random selection of fibers from my personal stash intended for the adventurous type. Basically, for those who want to feel touch and try a bunch of fibers but have no intentions of buying several ounces at a time. I've tried some alpaca samples at shows and the only ones that I've had luck selling are individual 1 ounce packages. In fact, I'm almost out. In fact, I should go put some together - right now.